Kris Rosales averaged just 5.2 points, 1.3 rebounds and 1.2 assists in 14.6 minutes off the TNT bench last season. 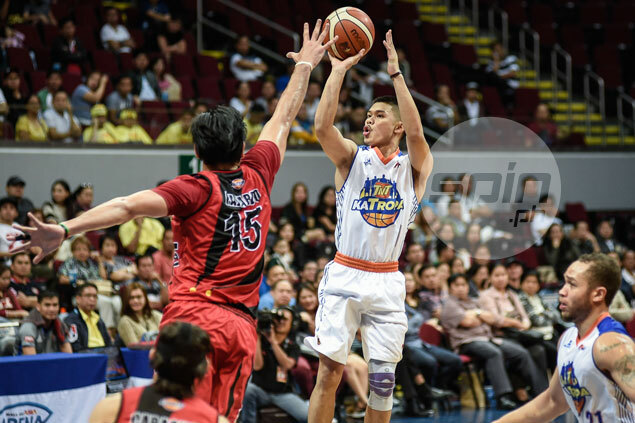 TNT KaTropa has thrown in another player in the trade that will get them Jericho Cruz from Rain or Shine. The Texters have added Kris Rosales to the package of rookie Sidney Onwubere and their 2018 first-round pick, in exchange for Cruz. The league approved the revised trade on Thursday, with the deal appearing on the transactions page on the league’s website. League commissioner Willie Marcial also confirmed the development in a text message. The 27-year-old Rosales averaged just 5.2 points, 1.3 rebounds and 1.2 assists in 14.6 minutes off the TNT bench last season. The 6-foot California native has not suited up in the Philippine Cup for TNT as he remains in recovery from a knee surgery late last year. Rosales has played two years so far in the PBA, all with the KaTropa, after going unsigned despite getting selected in the second round of the 2015 PBA Draft by Barako Bull and turning heads with his ABL stint as part of the Singapore Slingers.